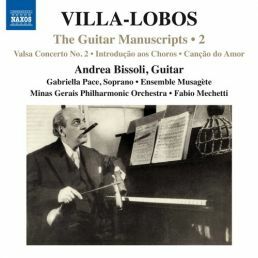 The genesis of Heitor Villa-Lobos’s Études goes back to his first meeting with the Andrés Segovia, at which the legendary guitarist asked for one étude and the composer ended up writing twelve. Andrea Bissoli returns to the original 1928 manuscript, restoring elements lost in later publication and reliving the magic of those times on an instrument almost identical to Segovia’s. 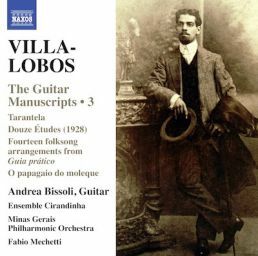 The Tarantela was probably also written guitar in hand. 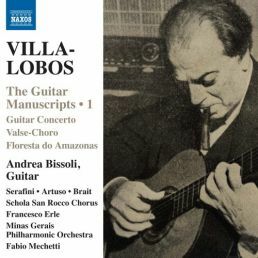 For his ‘folk ensemble’ instrumentation of the brightly coloured songs of the Guia prático, Bissoli has sought out traces of the guitar in the original and chosen a selection of pieces tailor-made for his instrument. The exciting story of O papagaio do moleque (The Little Boy’s Kite) concludes this third and final volume of the series.